Lately I have been thinking more and more about eloping! Not only because the thought of getting married in the sunshine sounds so appealing right now, seriously when will this rain ever stop! But because like today’s couple, I feel a little underwhelmed at the thought of getting legally married in either a registry office or church. In the UK we are seriously limited for options when it comes to legal bits, as new bride Kate explains. “Myself and Alex are both from Yorkshire, where we had originally booked our wedding. We both fell in love with the venue but sadly they didn’t hold a wedding licence, which meant to be legally wed we would have to get married in a church (neither of us are religious) or a registry office – the options for which are a tad depressing near us.” Explained Kate. American Photographer Nicki met up with the couple at the the Manhattan Marriage Bureau in NYC for their wedding early in the morning. “We arrived just after they opened and got through the line in no time. After their short and sweet ceremony at City Hall, we went off to take photos around NYC. 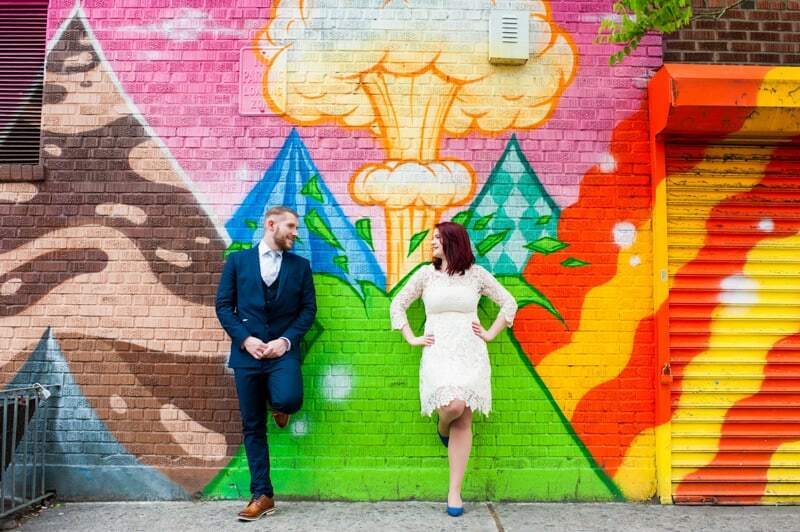 We made our way to the Love Wall in Soho, stopped at a nearby bakery for cupcakes and then hopped across the Brooklyn Bridge for photos with some great street art in DUMBO and finished along the Brooklyn Bridge Park waterfront.” She told us. Looks like these graffitis were made special for this couple. Can you write me please the locations you took images?